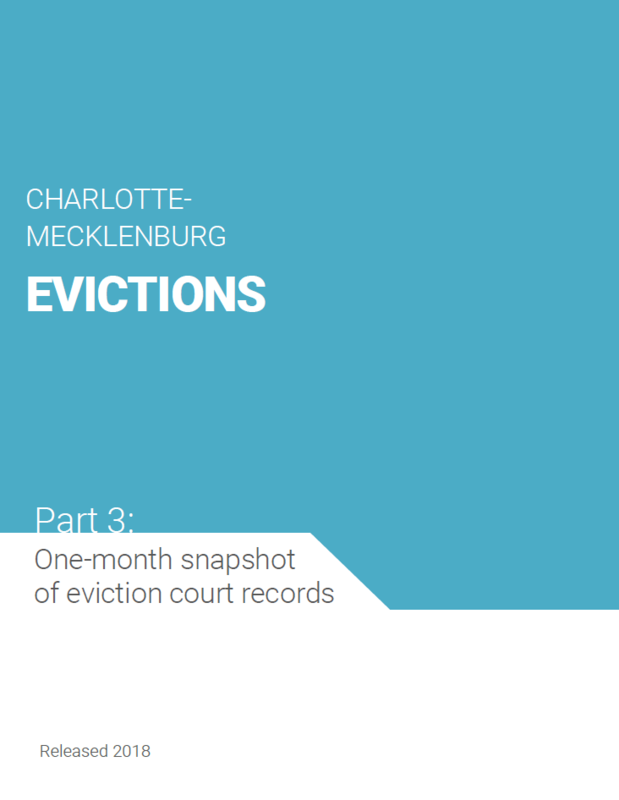 Last week, the UNC Charlotte Urban Institute and Mecklenburg County Community Support Services released the final report Charlotte-Mecklenburg Evictions Part 3: One-month Snapshot of Eviction Court Records in a three-part series devoted to local data on evictions in Charlotte-Mecklenburg. This post is devoted to linking the information from all three reports. To do that, we have developed a Evictions Fact Sheet that takes the essential information from the three report briefs. It also includes new information from The Eviction Lab, which was released in April 2018 by Princeton University and Matthew Desmond, author of Evicted: Poverty and Profit in the American City (2016). In addition to information from the eviction report series produced by UNC Charlotte Urban Institute, the Fact Sheet provides ways for you to get involved in big changes that can reduce and prevent evictions in the community. These opportunities and others listed on the eviction report series toolkits are developed by Mecklenburg County Community Support Services. 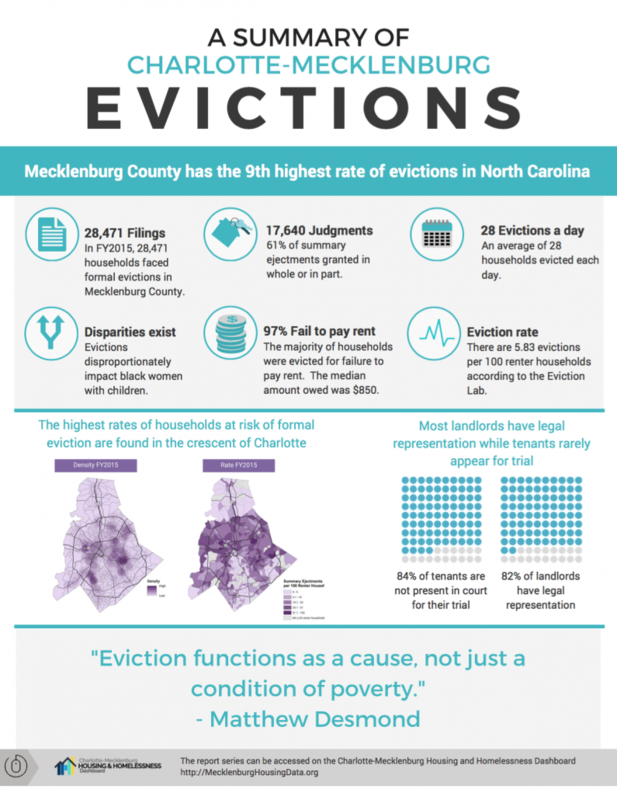 Most evictions in Mecklenburg County were due to failure to pay rent. Households who experience eviction often become homeless. Once homeless, the path back to housing can be more difficult and costly, for the household and community. We need to link strategy, funding and programs across the continuum from housing instability to homelessness to effectively and comprehensively tackle complex, cross-cutting issues that impact housing. We must also leverage existing systems and resources in the community to provide housing, legal, financial and supportive services to help households maintain housing and provide a pathway to economic opportunity. Develop cross-sector partnerships and collaborations that maximize existing expertise and resources that lead to housing sustainability, including education, childcare, transportation, financial literacy, social capital and employment. Breaking down silos is critical to creating sustainable change that can positively impact everyone in the community. Develop a community wide strategy with all public and private funding and resources for housing, housing instability and homelessness to create a continuum of housing assistance that effectively allocates resources across all levels of need and populations. Most landlords have access to legal representation, but the formal eviction process in court can be difficult to maneuver. Most tenants do not have representation and do not appear in court, which increases their likelihood of receiving a judgment for eviction. We must provide access to legal representation and information to tenants and landlords to help reduce evictions and when possible, resolve the issue outside of the court system. Increase capacity for pro bono legal representation for tenants. Provide information on tenant and landlord rights and responsibilities before the eviction process starts. Develop a pre-complaint resolution process to allow tenants and landlords to negotiate repayment of rent outside of the court process which reduces the added legal costs and court resources. Changing the system is not possible without political will. Political will is when there is a sufficient set of decision-makers who share a common understanding of a specific problem and are committed to supporting a commonly perceived, potentially effective policy solution. Everyone in the community can influence political will. Listed below are big ways you change the system and how to get involved. Email Hannah Guerrier (Hannahg@legalaidnc.org) to volunteer with the Homeless Prevention Project (HPP), which trains volunteers to educate tenants on their legal rights while they wait for housing assistance at Crisis Assistance Ministry. This commitment requires a small amount of time, but the impact is large. You can empower tenants with information that can prevent evictions. Ask to meet with leaders in your neighborhood, faith community, place of employment, local elected officials and share this information. Call for, support and highlight new and existing housing programs, initiatives and strategies that are willing to collaborate cross-sector, leverage existing community resources, strengthen tenant – landlord relationships, and promote long-term housing stability for households who need it most. If it doesn’t exist, ask why. The first report in the series released in September 2017 provides an overview of the formal eviction process and shows that evictions can have ripple effects beyond housing, impacting the overall health and long-term well-being of families as well as the stability of neighborhoods. 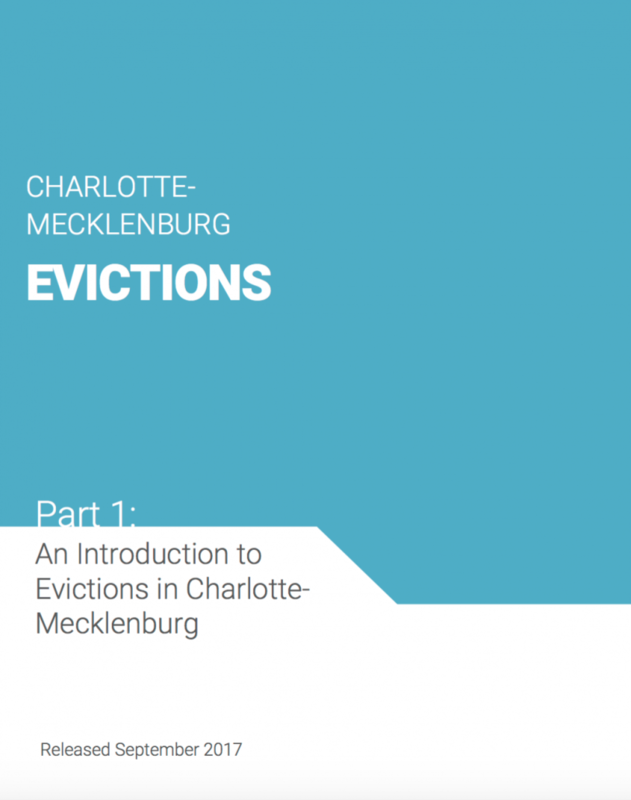 The first report also provides local data on evictions in Mecklenburg County. During FY 2015 – 2016, there were 28,471 households facing formal evictions in Mecklenburg County – about 2,400 households each month. Low-income black women are disproportionately impacted by evictions and families with children are more likely to be evicted. Employment and rental history are also two predictors of eviction. 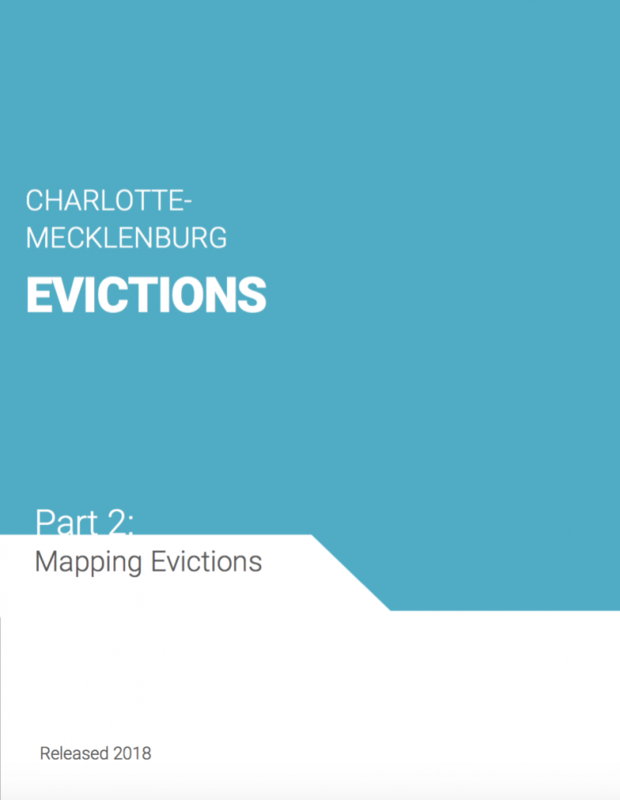 The second report in the series released in March 2018 maps evictions in Mecklenburg County at the neighborhood level, showing where formal evictions occur and exploring characteristics of neighborhoods with high and low rates of evictions. From FY2003 to FY2015, the number of areas where evictions are concentrated increased and gradually shifted outward toward the suburban edges of the county. The report reveals a geospatial pattern of evictions resembling the ‘crescent’ and ‘wedge’ and underscores the reality that not all Mecklenburg County residents have access to the same opportunities for housing stability. The third report in the series released in May 2018 focuses on how and why tenants are evicted and the cost of evictions for landlords and tenants. The report provides unique details of 1,940 eviction cases in small claims court during the month of July 2016. The report shows that most tenants are evicted due to failure to pay rent with a median amount owed of $850. Most landlords (82%) had legal representation whereas most tenants (84%) did not appear in the small claims court trial.